Those of us who travel to other countries will recognise the excellence of Australian clinical health services. 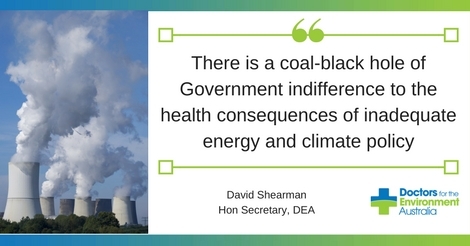 In contrast there is a coal-black hole of Government indifference to the health consequences of inadequate energy and climate policy. 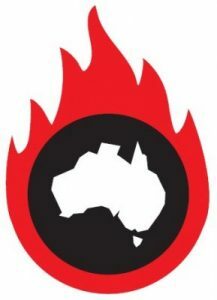 There are an estimated 3000 deaths pa and many illnesses in Australia due to heart and lung disease from air pollution caused by coal combustion in power stations and from vehicle exhausts. Every move from coal-fired power to renewable power saves lives. Every reform of air pollution laws saves lives. In this context the Prime Minister’s proposal to keep open heavily polluting Liddell as the solution to his government’s failures in energy policy must be condemned. The PM’s Trumpian statement evades mention of the high cost of coal when health externalities are included, and his government rails at renewable subsidies when those of coal are greater. The health costs of pollution in the Sydney to which Liddell contributes are estimated to be $8.4B p a. Many doctors experience despair and frustration at the lives being lost now and, increasingly, will be lost in the future. There has been a decade of political bickering and standoffs on this matter which, in medical terms, is negligence. If medical care teams behaved similarly, the Medical Boards would act, courts would become busy, hospitals would be censured and resignations would occur. Parliament must recognise that the effects of climate change are now operating and accelerating on the world’s physical and biological systems and that they can come like an express train. Australia’s response, instead, is invested in a slow train, trailing further and further behind the express. Indeed, some of our elected representatives have missed the train or even deny that trains exist. Parliamentarians know that every election has, as its main issues, cost of living, education and health services and it is these that decide votes. Given the increasing impacts of climate change, successful governments will need to offer an extra dimension to their repertoire. This dimension is called Leadership and the first step in leadership is to determine secure scientific, technical and delivery options for a way forward. It is against this background of disarray and incompetence that the Senate is conducting an inquiry into the impacts of climate change on infrastructure including energy. Does this reflect the glimmer of light before the dawn? Or that the expected global trillion dollar costs of climate change and billion dollar costs of air pollution have become a worry? Or that impacts and costs are already are occurring in Australia? Did the terms of reference reflect sudden haste because some vital infrastructure, such as agriculture and defence, was overlooked? In essence, ‘cost’ means budget difficulties and electoral problems. The Business Round Table reported that the cost of Extreme Weather Events (EWE) in the 2010-2011 Queensland floods was a tangible asset loss (infrastructure) of $6.7B, and that this was further exceeded by intangible losses of $7.4B. The latter figure represents on-going health and social costs for the Queensland Health Services. Similar figures were quoted for other climate-change related EWE in Australia. The Business Round Table report said that these tangible costs were expected to rise to an average of $33 billion per year in real terms by 2050, unless steps were taken to increase resilience and address mitigation. Business now has a clear understanding that the multiple risks of climate change are real, that ignorance of them is no longer an excuse. Companies now know that their funds and infrastructure are exposed and, yet, because emission reduction is mired in a political swamp, we have no plan to alleviate the ravages of accelerating climate change. There may be another belated recognition behind this senate Inquiry. Presently, the world’s entire economic system depends on progressive growth. Climate change is eating into the budgets of many countries and of the states in Australia. In 2005 the Stern report predicted a cost to the world of $9 trillion. Growth may well continue in its present trajectory, but will consist increasingly of reparation and not a rise in living standards. Now, this is an electoral problem to galvanise the mind of Senators, and even Treasurers, obsessed with simply tweaking the threads of the spider-web of taxes. The reason it hasn’t induced an appropriate response is that politicians hide or deny difficult issues or push them beyond the next election. Hopefully the fiscal impact of Hurricane Harvey may be the equivalent of ECT therapy. Parliamentary Inquiries have many limitations. While submissions are made from organisations with significant expertise, the outcome of the Inquiries depends on the ability of the Committee to grasp complexities. In fact, often the report is bedevilled by political position and ideology and any dissenting report produced is ignored. Four years later the Senate is asking the same questions and getting the same advice from health experts. iv) compliance by state and territory authorities. In our view, to act successfully, this responsibility will require a Statutory Authority linked to and working with a National EPA, to which Health Departments provide input, independent from political bias and with an Australian panel on climate change. A national taskforce of stakeholders and government could develop the necessary framework. Doctors believe in a world where basic health needs are a human right. Advances in health care over the past few decades, both clinical and preventative, have been well beyond expectation. We see these benefits to humanity being eroded by the confluence of damaging human activity and climate instability, and their ‘external’ costs. What we really need to develop is secure treatments for political blindness and impotence. 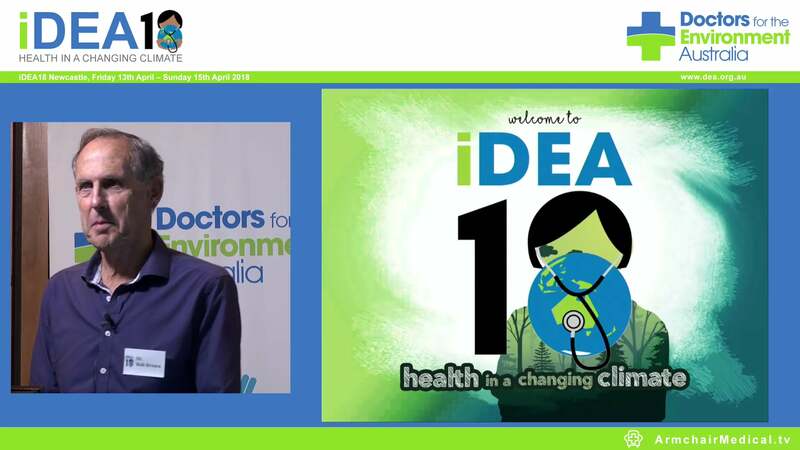 This article was written by Dr David Shearman AM FRACP, Hon Secretary Doctors for the Environment Australia.